I was inspired to make this three-cheese macaroni by a dish we encountered several years ago in an upscale restaurant. I've experimented with it a bit over time, and this is my final version. It isn't hard to make, but it does require plenty of prep time. Including everything, grating the cheese, cooking the pasta, making the sauce, baking the finished product, allow 1 ½ to 2 hours. Cook the pasta according to package directions. Drain it and toss it with the olive oil (to prevent sticking). Set aside. Melt the butter in a medium saucepan. Whisk in the flour and continue to cook over medium heat for a minute or two, constantly whisking. It should get a little bubbly. Gradually add the milk, stirring constantly as it cooks over medium or medium-low heat. The mixture should thicken to the consistency of heavy cream. Continue to cook over medium heat and add about half the cream cheese, stirring constantly until it is almost all melted. Do the same with half the Gouda and Gruyere. Continuing to cook over medium heat, add the rest of the cream cheese and keep stirring until it is melted. Set aside ¼ cup each of the Gouda and Gruyere. Add the remaining shredded cheese, and continue cooking and stirring until all the cheese is melted. If necessary, use a whisk to get a smooth texture. When the cheese sauce is smooth, remove it from the heat and mix it thoroughly with the pasta. Put the cheese-pasta mixture into a lightly oiled, 3-quart (or larger) baking pan. Sprinkle the set-aside grated cheese evenly over the top of the mixture. Mix the panko bread crumbs with the dry seasonings, then sprinkle evenly over the top of the mixture. Bake in a preheated 400-degree oven for 30-40 minutes, until the top is nicely browned. 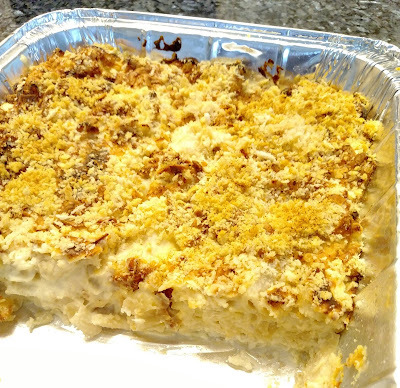 This is a very rich, cheesy dish, and one of my husband's favorites. There is enough here to serve 12. We usually have seconds the next day and then freeze the rest. It is delicious reheated with a little butter. I made this with gluten-free brown-rice pasta, but in the past I've used conventional pasta, and there is no difference in the flavor or texture of the end product. A restaurant we really like makes something very similar to this, with bite-size pieces of duck mixed in. I have sometimes made this with honey-baked ham, and a friend recently suggesting making it with lobster. My pal Annie suggested using this to make mac-and-cheese balls. That's a great idea. I would bake it without the toppings, chill thoroughly until firm, and then make two-inch balls coated in egg wash and panko crumbs for frying or baking. This is a very light-colored dish, which is fine with me. For more color and a flavor variation, you could add paprika or smoked paprika. I've seen recipes that recommend adding sauteed or carmelized onions. This can be made with different cheeses. It's fun to experiment. I would not suggest low-fat or non-fat cheeses, because they do not melt as well and do not taste as good. Assuming 12 servings per recipe, and using the information on the packaging of the ingredients or online sources, my rough estimate is 410 calories per serving, which includes 200 calories from fat. A serving has about 22 grams of fat, 21 grams of protein, 34 grams of carbohydrates, 614 mg. of sodium. It is low in fiber, also low in sugar, and has tiny amounts of a few other nutrients. Nutritionally, this is actually better than I expected. Serve it with a salad or some broccoli, and you've got a very nice dinner. Thanks for the comment! We like this dish a lot. I'm going to try my friend's suggestion to make it into fried or baked mac-and-cheese balls. Yes! Thanks for the comment.